Description: Small red crosses at Baverstoke, at the top centre, and Et Knoyle, at the top left,mark observation points used by the surveyor to plot topographical details and measure distances. 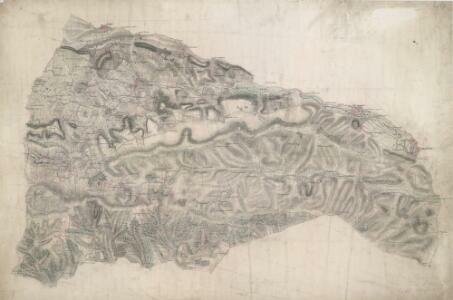 The draughtsman has faithfully recorded the relative relief of the hills and indicated areas of woodland, using various shades of green to distinguish woods from grassland. The ancient circular earthworks of Chiselbury are marked by concentric rings on White Sheet Hill, in the centre of the drawing.